The “pre Box” CF1 cut-out is the correct equipment for 'Sevens' built from 1924 to 1931. However, Tilly is in the middle of a 12V conversion, in that a modern battery has been fitted, but no other modifications have been made to the cut-out circuit. This really isn’t wise, as the shunt winding in the cut-out is being overstressed. Moreover, the closing force on the contacts is twice as high as necessary, resulting in very late contact opening when the engine revs fall. In order to avoid burning out the shunt winding when running on 12V, it is essential to make only 6V appear across the winding itself. On later types this is easy to do without altering or removing the cut-out, as shown later. However, on the CF1, a small modification is needed. 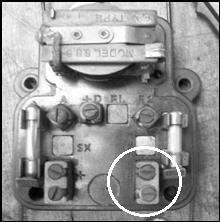 The significant fact about this type is that the shunt winding is connected to Earth via the screws on the metal framework connecting to the body, rather than via a separate wire as in later cut-out types, such as the CFR (Box, early Ruby), or CFR2 (Late Ruby). The shunt winding has a resistance of about 33Ohms. Therefore, to limit the current through it to the same as it would have been on 6V, it is necessary to connect a 33 ohm resistor in series with the winding, (the one on the right of the diagram). The photo shows the back of the cut-out, together with labels for the connections. Cut the flexible wire connected to the brass strip labelled D in the picture. The D terminal is actually at the top right, but the current runs through the fuse and the second brass strip. Cut it near the solder joint to the brass strip so that there is plenty of tail if you wish to put it back at some other time. Now connect a 33Ohm 3 watt resistor between the terminal at the brass strip and the free end of the wire. At the terminal end, make a “pigtail” by curling the wire one and a quarter turns around a thin pencil or similar – this helps prevent vibration induced fractures as the wire is free to give a little – and insulate it with some sleeving. I use the insulation from a bit of stripped mains cable as it is easy to thread over the resistor lead. Provided that it isn’t too fat, Araldite the resistor onto the back of the cut-out, (not with hot melt glue – the resistor will get warm in operation). Now the cut-out is ready for work at 12V. 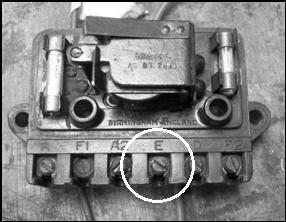 For the CFR or CFR2, all of the wires need to be removed from the E terminal (circled) and connected to the earth stud on the bulkhead instead. A 33 Ohm resistor, suitably mounted, is connected between the bulkhead earth stud and the E terminal. 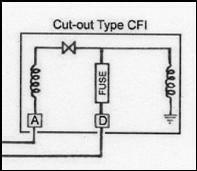 This causes the cut-out E terminal to “float” at 6V above bodywork earth, and therefore only “see” 6V in a 12V system. As with the CF1, the resistor must be mounted so as not to suffer vibration. In this instance, the aluminium clad type may be aesthetically more pleasing. This article, written by Lee Webster, originally appeared in CA7C Seven Focus in Mar 2007 pp24-25.